96.3 The Zone is giving you a chance to beef up your bank account! 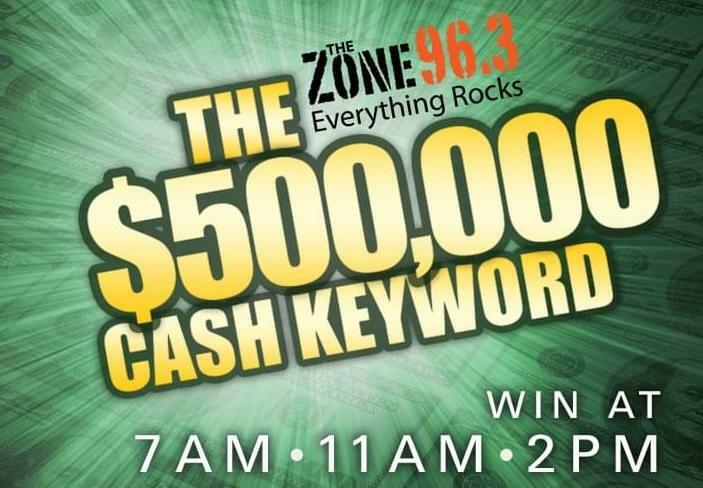 It’s the return of the Five Hundred Thousand Dollar Cash Keyword! It’s simple to play – just listen at 7am, 11am and 2pm as we give you a new keyword 3 times each weekday. Once you hear the word, text it to 40772 within 10 minutes for a chance to instantly win $200! You can enter one time for each keyword we give and you COULD win EVERY TIME! That’s 15 chances to win every week. Each $200 winner will also go in for a shot at the GRAND PRIZE – a chance to win FIVE HUNDRED THOUSAND DOLLARS!